Plantation shutters are an elegant design addition to any home and add to both the home’s aesthetic and financial value. These perennially popular additions to upscale homes of any style have slats that are fitted onto a frame inside of the window. Interior shutters are an attractive, long-term design investment for any finely furnished home. The insulation potential of interior shutters during harsh winters contributes significantly to energy savings on heating bills, offsetting the initial expenditure in just a few years. An often overlooked benefit of installing shutters in your home is that according to the IRS, the installation is considered a capital improvement that turns into tax savings when the home is sold. Some homeowners like the timeless appeal of solid shutters for the utmost privacy. This design style is an excellent choice for French doors in quaint country homes, as they can be opened to allow light in during the day and shuttered at dusk. Interior shutters can be double-hung, with both the top and bottom windows fitted with separate shutters, or installed as café-style, with only the lower half of the window covered. Double-hung interior shutters can be partially opened to allow for ventilation, while still accommodating privacy needs, giving them a special appeal in homes along the shore. These are contemporary interior shutter design, with louvers that are typically elliptical (but can also be flat), and with thickness between 2 ½ “- 4 ½ “. When they are closed, plantation shutters effectively block out light almost entirely. These types of interior shutters are often used in larger rooms, such as great rooms, formal living rooms and dining areas. Their ability to almost totally darken a room makes them a versatile and popular choice for master bedrooms. Additionally, they are especially effective at blocking out harmful UV rays that are so damaging to expensive fabrics on furniture. Due to their popularity in modern homes, manufacturers offer a wider variety of styles and varieties of plantation shutters and they can be customized to suit your home’s unique style and design needs. 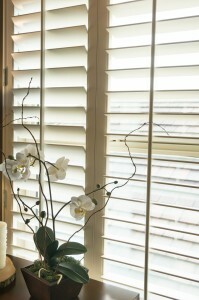 Wood remains the most popular, albeit the most expensive, option for plantation shutters. Newer styles now utilize faux wood and vinyl, and some faux wood versions are almost indistinguishable from actual wood at a fraction of the cost. In high humidity environments like beachfront homes and bathrooms, vinyl can make a good choice. Because the vinyl and faux wood applications are not only less expensive but also durable and easy to maintain, they are gaining in popularity. 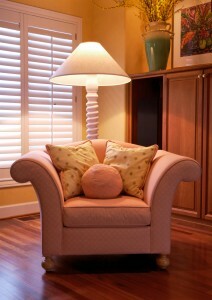 However, for the purists who select traditional colonial shutters, wood remains the only construction material used. The choice of shutter color is important for them to blend seamlessly into the room’s décor or to serve as a design contrast. White and natural light woods are generally better for rooms dominated by darker colors and heavy furniture. Spare, minimalist styles may benefit from a darker color that serves as a focal point. Whatever your preference, we can make your design dreams a reality. 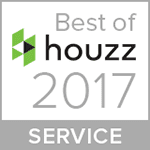 We offer the highest quality shutters from industry leaders like Hunter Douglas and Norman Window Fashions. Call us today for a professional and complimentary in-home design consultation.